If people would be more focused on improving their own shortcomings, they wouldn’t have so much time to criticize others. Do you agree? I always like to share personal stories because I don’t want people to think I have it all figured out. Unfortunately I haven’t but I am working on it every day. As a matter of fact, these daily messages are as much education for me when I am writing them as they are for you when you’re reading them. I am not a structured person. In fact, I find structure quite boring. Having said this, I may not be structured but I am super committed and dedicated to be at my best. Of course, in certain areas of our life structure is necessary in order to get things done. For example, I get up at 5 am EVERY day during the week and I start working out between 5.45 am and 6 am. Usually it is about 1 hour. The only reasons when I don’t work out early in the morning are when I travel, facilitate a workshop or when I have a super early coaching call. There are many times when I don’t feel like working out but I still manage to convince myself to get out of bed. How? I remind myself of the feeling how incredible I feel after the workout. I have anchored (NLP Anchoring Technique) that feeling and it helps me to get out of my bed, especially in the winter. Now while this is considered personal time, I transfer my level of commitment and dedication to business. The mind is very complex and I practice everything I want to be as a person in my personal life in order to bring it to my professional life. It is all about authenticity. How can help my clients to achieve organizational fitness if I am not mentally and physically fit myself? I honestly don’t like excuses and if I don’t get something done, I own it. I either didn’t prioritize properly, had poor time-management, procrastinated or I simply had a non-productive phase. It happens. We are all humans. We are far from perfection and that’s o.k. 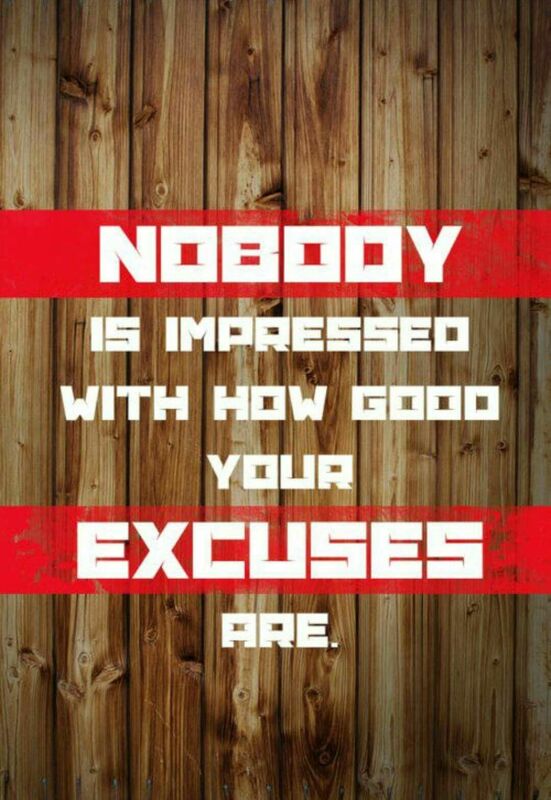 Excuses are not. They start with good intentions and end with blaming people and outside circumstances. Did you know that the cure from excuses is execution? I love that thought. Happy Friday!